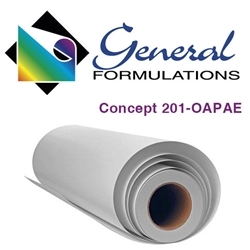 Concept 201-OAPAE (Air Egress) is a 3.4 mil premium matte white flexible calendered vinyl film coated with 200-5031 permanent gray acrylic pressure sensitive adhesive laminated to a 90#AE layflat liner. This film is designed to accept a variety of solvent-based UV curable and latex inks common to wide format digital printing systems. Adhesive 200-5031 offers good opacity with low initial tack building to a permanent bond within 24 hours providing repositionability to the graphic during application. The 90#AE liner offers excellent product layflat in a variety of ambient conditions along with ease of application for large format graphics. Concept 201-OAPAE is designed for large format interior or exterior signage, decals, nameplates and point-of-purchase displays.